Dec. 18 2003, 8:15am — The Fourth Geneva Convention stipulates that an occupying power must provide for the health and well being of the people under occupation, and not interfere with their medical services or needs. We start out from the Palestine Red Crescent Society (PRCS) HQ (what the Red Cross is known as in Palestine) in Al Bireh (next to Ramallah) for a pick up and transfer of patients south of the Qalandya Israeli army check point. Our ambulance, donated by the Norwegian Red Cross, is well equipped for most emergencies. The ambulances are clearly recognizable as such. I am riding with two Emergency Medical Technicians, Emad and Mohamed. They dress in bright red uniforms with large Red Crescent patches and reflective tape. 15 minutes later, we are blocked at the Qalandya checkpoint traffic jam. Even on a good day, the checkpoint creates a multi-directional traffic jam as vehicles and pedestrians dodge each other. Qalandya is next to a section of the electronically monitored separation fence, an Israeli only settler road, and their industrial compound of Atarot. Many Palestinian cars and trucks are let through without a search, but not the ambulance. Israeli soldiers with rifles enter and make us open up medical kit bags, the side bench seat and the oxygen tank storage door. Emad our ambulance driver speaks Hebrew to the soldiers as the inspection continues, and of course we must show our IDs. Meanwhile, outside, another soldier behind a concrete barrier has his rifle trained on us during the inspection. Returning back to the A-Ram checkpoint with a mother and her one-year-old boy who has leukemia, we are once again, the only vehicles searched. 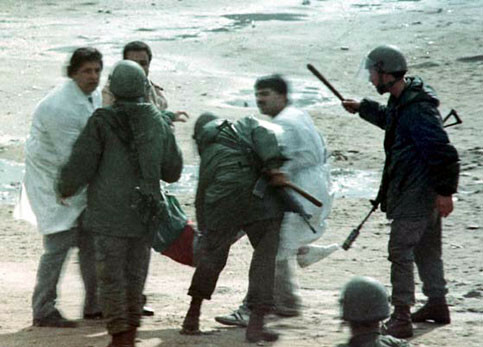 Emad convinces the soldier, in Hebrew, that the baby must get to his medical appointment, even though this is not strictly speaking an “emergency”. We are allowed to continue back to the Qalandya checkpoint area where another ambulance is waiting for the baby and his mother. Ahmed explains that often, the soldiers do not permit ambulances to pass through the checkpoints. We pick up another patient — an elderly woman suffering from diabetes and cardiac disease. Although, she is going to the Palestinian hospital Al Maqased in Jerusalem, just 15 km away, we have to pass through another checkpoint. Besides the usual search and ID check, the Israeli soldiers want to inspect the woman — her husband duly lifts her blanket revealing her amputated left lower leg and a urinary catheter. Total time at check point: 1 hour. On my next run, I ride with Luay and Ahlam in a slightly more modern ambulance donated by the American Red Cross. We return to the Qalandya checkpoint, as there is a car accident just across from it. This time, the Israeli soldiers check no IDs as they look inside the ambulance and then let us through. Two cars have collided on top of a hill and thankfully the impact wasn’t forceful enough to push either over the edge! One driver, still in his seat, is wearing a neck collar placed by an Israeli soldier that protects his cervical spine. With the soldier’s help, we move the patient safely to the stretcher, and get him in the ambulance. Another soldier gives me the man’s ID. The young man is suffering from pain to his upper back and left shoulder. (If he had been wearing a seat belt, which Israelis and Palestinians are loath to do, he would probably be just sore, not banged up). Ahlam starts an IV on him, we re-secure the neck collar and proceed to take him to the Israeli Hadassah Hospital in Jerusalem. However, a minute later at the A-Ram check point, we’re put on hold: The soldier doesn’t want us to pass because the patient is not obviously in critical condition. He checks the patients ID, hands it over to another older soldier. This soldier belongs to Dept. of Coordination, set up to coordinate between the Palestinian Authority and Israel. Luay explains that the Palestinian accident victim has Israeli residence, adding that if required, we can call the International Red Cross Society to seek authorization for his passage. This seems to convince the soldier. They once again thoroughly search the ambulance before we can continue to Jerusalem. At the gates of the Hadassah Hospital, we go through checks and inspections by two different security guards. Before leaving the hospital, in order to confirm the inspection, a security guard makes Luay sign a sheet that we were properly inspected. It’s more of the same for the rest of my shifts with the ambulances. Short drives, numerous checkpoints, countless repetitive delays, inspections and questioning. We never leave the West Bank: Palestinian territory illegally occupied by the Israelis. Dr. Wael, the PRCS Emergency Medical Services General Director explains that the Israeli army justifies these practices based on an incident two years ago, when arms were found in an ambulance. “Western journalists, who investigated the incident at that time, were not convinced; not only because the ambulance had just passed through several checkpoints without being detained, but also because the army had already notified journalists to be present when arms were ‘found’ when it was stopped and checked again”. The checkpoint searches have the depressing feeling of being routine and normal. The EMT’s maintained a calm, professional rapport, and even act friendly towards the soldiers. The soldiers seem bored for the most part, sometimes friendly, but nevertheless, rarely waved us through like they do to most other vehicles. I on the other hand, was simply outraged at this basic violation of human rights and decency. It is not always safe. Soldiers firing at EMTs have wounded Ahmad twice in the last two years - once when he was exiting the PRCS headquarters. PRCS EMTs Ibrahim Assad and Bassam Bilbasee, and Dr. Khalil Suliman have been shot to death while on the job. PRCS ambulances have been damaged and destroyed by the army firing rifle and tank rounds at them. Since the start of the current Intifada, the Israelis have placed over 600 roadblocks throughout the occupied territories: 65 manned; 464 mounds of dirt and rubble; 58 trenches; and 95 concrete barriers. (Data from the UN’s Office for the Coordination of Humanitarian Affairs). What is done during an emergency when a bypass road around a roadblock may be a long, slow and treacherously eroded dirt road? The PRCS then will coordinate two ambulances to meet each other on either side of the roadblock. The night of December 20 in Bethlehem, we were called to pick up a 62 year old man with cardiac and respiratory difficulties at the Hebron/Bethlehem roadblock. We met the other ambulance there, and the young EMTs decided that it would be easiest to simply carry the old man in their arms over the steep mound of mud and concrete rubble to our ambulance. Later on, we rushed over to the Beit Jalla roadblock to meet another ambulance bringing Kathur Fanoon, a 25 year old women with labour contractions four minutes apart. We placed her on a portable stretcher, and carried her over 30 meters of slippery mud and rubble. An Israeli jeep was there, shining a spotlight on us. I thought they were being kind enough to illuminate our way in the dark, but they left when we got half-way over the mound. She arrived in the Beit Jalla Hospital delivery room before her baby did. I have been in Palestine during a period considered calm and routine, compared to previous high alert and high security phases. There have been no suicide bombings. After a week of riding inside an ambulance, I have to say that while theoretically, an ambulance has the capacity to transport hidden people or arms - so do cars and trucks. I observed an unmistakable discrepancy in the consistent inspection of ambulances - as opposed to cars and trucks - at numerous checkpoints. This seems to be Israeli policy clearly intended to sabotage the Palestinian’s emergency medical services and needs. Palestinian President Yasser Arafat asserted that Israel used depleted uranium against the Palestinian people, which was evidently verified by American and European assertions as well as the cancer rate among Palestinians has risen similar to that caused in “Hiroshima”. Arafat’s remarks came following his reception of a delegation involving Christian, Jewish and Muslim figures headed by Mitchell Koal on Sunday in his office in Rammallah. Speaking to the delegation, President Arafat disclosed that the Apartheid Wall had confiscated 58% of the Palestinian lands in the West Bank, besides the disastrous economic consequences the wall caused; destroying farms, factories and turning the Palestinian cities into isolated cantons. Arafat, who has been besieged in his battered compound in Ramallah for 19 months by Israel, pointed out that there are Israeli generals who refused to serve in the occupied Palestinian territories or participate in the criminal and wrong-doings committed there. He added that the Israeli occupying forces perished 64-65% of the olive groves and stole 90% of the palm trees in Deir al Balah, over 4,762 Palestinian houses were demolished and the toll of killed and wounded people exceeded 71,000. 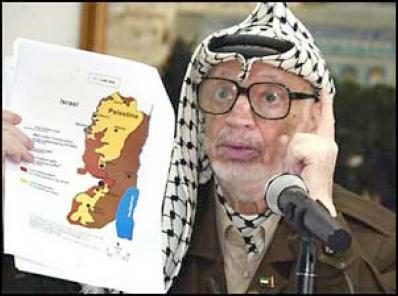 Grumbling about the Israeli movement restrictions, President Arafat mentioned that traveling between Ramallah and Bethlehem normally takes three hours but at present, travelers were obliged to wait long hours to cross the distance, not to mention that women in labor were denied access to pass through the checkpoints, and eventually they gave birth at the checkpoints. “Where do such doings happen in the world?” President Arafat exclaimed. Up to this moment, the Israeli government has not yet approved the "Road Map" peace process and conditioned about 14 amendments on the plan as well as the Israeli slam of all the agreed upon agreements including the Mitchell report, Tenet Understandings and the UN resolutions, President Arafat briefed the delegation. “We (Palestinians) want an equitable and everlasting peace that was agreed upon with the late Yitzhak Rabin,” Arafat said. Mr. Koal, on his part, asserted the backing of international and regional peace and dialogue and that the delegation came to solidify with the Palestinian people and to channel the Palestinian ordeal to Europe. Like many of the others, he suffered recurring severe convulsions for days. Ambulance drivers responding to one of the gas attacks found people on the street jumping around, thrashing their limbs in uncontrollable spasms. The victims seemed unaware of their actions and surroundings. These facts are all in plain sight. But chances are you've never heard about this chemical warfare against innocent civilians. It was not the work of Saddam Hussein, or the Russians, or terrorists, at least as the term is generally understood. It didn't occur in the 1980s, and it didn't require the satellite data and battle planning that the US military provided Iraq for its chemical warfare against Iran. The poison gas canisters were unfamiliar, marked only with a few numerals and Hebrew letters. The smoking gas they released was non-irritating and initially odorless. After a few minutes a sweet, minty fragrance would emerge. One victim recalled that "the smell was good. You want to breathe more. You feel good when you inhale it." The smoke often spewed in a "rainbow" of changing colors, ending in a steady billow of black soot. The gas, which caused no recorded fatalities, may have been a novel "nerve agent" developed in Israel's CBW laboratories at Nes Ziona, where they've been making nerve gases, and many other things, for decades. (20) Were these gas attacks an "experiment"? What has become of the victims? Who made the decision to conduct this criminal and inhuman campaign? These and many other questions about Israel's willingness to use chemical weapons demand answers. The silence about these attacks must end. Failure to investigate them and bring their perpetrators to justice is a violation of the Geneva Accords. America cannot make a case for war over potential chemical weapons in Iraq, yet turn a blind eye to the actual chemical warfare conducted by its "staunchest ally." "I tried to open the gas bomb so that I could throw it back at the Israelis. So I opened it and nothing happened - and then it started to blow in our faces. Some of the guys fled and some stayed. It didn't seem to have any smell and then it smelled like mint - you smell mint." "When I first had the canister the black smoke came out and the guys said, "what is this - it has no smell. It doesn't smell at all." Then, after a while it had the smell of mint. Mint, mint, mint, and the guys said, "it's harmless - this gas is nothing." We thought it was like the first gas that makes your eyes water, and so we started shouting to the Jews: "Throw more! Throw more!" So they started throwing more canisters. And then the jeep left and I had the canister in my pocket and I started playing with it - the guys were around - and it started spurting more and more smoke into my face - I got up and went home and lost consciousness." "The house was hit. We thought it was a fire – we tried to put it out. But it wasn’t a fire. At first there was white smoke - then many other colors. Like a rainbow. And the smell was good. You want to breathe more. You feel good when you inhale it." "I was going to the Mosque to pray on Sunday evening prayers. Then near the mosque the guys said there's a house fire - and we headed over to the house near the mosque - there was thick black smoke coming out." "This gas – you can’t extinguish the canisters with water or a blanket or anything...the gas is sweet smelling. I mean, the gas doesn’t make you want to run away, or think it might be bad for you. You feel as if they are spraying a smoke in the air." "I looked up and I saw black smoke coming out of the house. I thought there was a fire – I was surprised that there was no fire. There was a canister with black smoke coming out of it. I smelled something like mint." "The kids said 'The house is burning.'" "First of all the smoke was white, then yellow, then black. Its taste was like sugar - the smell was sweet. It was not unpleasant to smell." After that I couldn’t shout at all – I couldn’t make a sound.The people tried to come into the window – but they were unable to break the bars. They kept trying to extinguish the gas canister, but they couldn’t because of the smoke – they would come close and then retreat after 10 minutes I couldn’t even see my children through the black gas. Nobody could save us. Finally they put out the gas canister. We were suffocating – we couldn’t make any sounds – I didn’t even know if my children were alive or dead because of all the black smoke. "They were throwing gas, and we didn’t think it was poisonous We thought it was smoke." "..and somebody said there was a fire in the camp – so we headed over to put it out. When we got there – we were surprised that it wasn’t a fire – but a thick smoke of several colors." "The guys said there’s a house fire – and we headed over to the house near the mosque – there was thick black smoke coming out." Question: Could you describe the gas? In early 2001 I spent three months in Gaza filming material for this documentary, GAZA STRIP, working with local fixer and translator, Mohammed Mohanna. 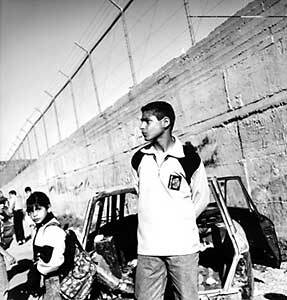 The second Palestinian uprising against Israeli military occupation had begun in September, 2000, and there had already been large numbers of deaths in Gaza when I started this project. Though the period this documentary covers includes the election of Ariel Sharon as Israeli Prime Minister and large incursions by the Israeli Defense Forces into Gaza, in retrospect the time depicted here is one of relative quiet. More recent Israeli attacks against Gaza have been far more destructive and deadly than what falls into the scope of this film. The time since the release of this film in 2002 has seen many changes, including the evacuation of illegal Israeli settlements inside the Gaza Strip and the election of Hamas. However, the occupation and attacks against Gaza continue, and the blockade of Gaza has intensified. It is my hope that this film will provide a partial introduction to Gaza for those who have come to the subject recently, and also serve as a document of its time. James' vimeo account check it out! • III. Doctors ask, 'What am I treating?' - Nerve Gas? • VIII. Were the gas canisters designed to attract? The people of Khan Younis are utterly familiar with teargas; their neighborhood had long been known as one of the most heavily teargassed areas in the Occupied Palestinian Territories (OPT). But no one in Khan Younis recalled seeing these strange canisters before, or their seemingly harmless multicolored smoke. During the following six weeks, the Israeli Defense Forces would continue to deploy this novel weapon against civilians. In all, at least eight separate attacks with the "new gas" are recorded in the Gaza Strip and West Bank. According to the Israeli government, the victims of these attacks were suffering from "anxiety." Fifteen months later, when President Arafat publicly alleged the use of "poison gas" after the initial attacks in the Gaza Strip, the Israeli response was strangely muted and terse; reports of a new poison gas were merely "incorrect and false", and the matter was dropped. It would appear Israeli authorities wished to avoid drawing attention to the new "poison gas" charges. The April 5 - 11 issue of Al-Ahram Weekly featured the story, Vale of Tears: Tear or Poison Gas?, by British journalist Jonathan Cook. It tells the story of an Israeli poison gas attack in the schoolyard of Al-Khader village, near Bethlehem. III. Doctors ask, 'What am I treating?' - Nerve Gas? If the new Israeli weapon was a form of nerve gas, as a number of observers asserted or suggested at the time,(26,27) the Israeli claim might have been partially true; anxiety is one of the many symptoms of nerve gas poisoning. (28) However, as far as we know, no identifying chemical assay of the gas exists. It appears that the last official comment by the Palestinian Authority about the gas was Nabil Shaath's February 15 announcement that it would be independently analyzed. Much work remains to be done. It may be that a few of the gas canisters can be found and tested. It is possible that test results exist, yet lie unpublished. The victims, and their doctors, need and deserve to know what poisoned them, and governments seem unwilling to help. But we do not need to know the poison's chemical identity to study its effects, or to consider the standing of these attacks under international law. At the time, the UN researchers did not have a chemical assay, apparently made little or no use of biological analysis, and worked with only six victims. Despite these handicaps, the UN team was able to reach a strong conclusion about the type of poison used, largely because the anticholinesterase nerve agents produce a unique and striking pattern of symptoms. In the situation, any other diagnosis would very likely have been implausible. Another team of experts may reach similar conclusions after thoroughly reviewing the documented cases of the Palestinian gas victims. It appears that Israel has had the ability to produce and weaponize a variety of banned chemical agents, including the full array of nerve gases, for many years, in much larger quantities than would have been required for last year's sporadic attacks on Palestinian civilians. Noted for its innovations in weaponry, Israel could certainly have produced the dispensing canisters used in these attacks. It is also clear that Israel had access to the raw materials needed to make nerve gases - they have been shipped directly to the IIBR from the United States. Whether the new Hebrew-lettered canisters were the brainchild of Israel's own IIBR, or purchased from another source, the enormous suffering they caused remains the same. Reading about the days and weeks of suffering endured by the gas victims is a very disturbing experience. Yet, we can read it, because these crimes are well-documented. In addition to the shocking evidence he captured on film, Longley compiled a 43-page document of translated interviews with nineteen gas victims, and interviews with victims' relatives, ambulance drivers, and doctors on the scene in Khan Younis. Most victims of the "new" Israeli gas apparently began feeling ill roughly five to ten minutes after their initial exposure, though shorter and longer periods were reported. Their suffering rapidly mushroomed, until they went into convulsions and lost consciousness. Many victims were incapacitated with multiple, agonizing symptoms for several days. Some victims, including children, were afflicted for at least several weeks. Taken altogether, the reported symptoms present a bewildering array of serious bodily malfunctions. For a clearer perspective, the eyewitness reports of the victims' suffering were arranged in three sections: 1) Early onset symptoms, 2) Main acute stage symptoms, and 3) Persistent, post-hospitalization symptoms. To review these accounts, and a table in which reported poison gas symptoms are compared to known nerve gas symptoms, see Symptoms. For a more direct understanding of what the Palestinian gas victims endured, see the Web video, Gaza Strip: Interview with James Longley, which includes clips from the documentary, Gaza Strip. What the gas victims recalled about the onset of their symptoms does not agree with the reports of witnesses and caregivers who were with them at the time. Typically, victims remembered starting to feel weak and sick, with bad headaches and/or severe stomach pains and vomiting, proceeding directly to loss of consciousness. "After that, I knew nothing until I woke up in the hospital." Some victims recall collapsing or being unable to stand before they passed out. These highly unusual symptoms are generally considered to be the cardinal early warning sign that a nerve gas attack is in progress: "In case of a terrorist attack, suspect the [nerve gas] diagnosis when multiple patients present with symptoms of cholinergic excess. "(48) "Cholinergic excess" means excessive nervous system activity, manifested as tics, fasciculations, spasms, and convulsions. Most victims reported regaining consciousness in the hospital, after hours or days in a "coma-like state", during which some also had periods of spasms and convulsions. Following their first awakening, the accounts of victims are generally in agreement with those of the doctors and relatives who cared for them. What can the suffering of the Palestinian gas victims tell us about the contents of the Israeli gas canisters? As described in Part III above, investigators can sometimes identify the class of a chemical weapon by studying the symptoms of its victims. The order in which the Palestinians' symptoms appeared was also very similar to the progression of nerve gas poisoning. The persistence of symptoms suffered by some Palestinian victims is characteristic of severe nerve gas exposure. The evidence strongly suggests a potent anticholinesterase effect (see sidebar, The Nerve Gases, for more information). To our knowledge, there are no reports of fatalities resulting from the Israeli poison gas attacks of February and March, 2001. Although the public usually associates nerve gas with mass death, fatality rates in wartime nerve gas attacks have generally been less than five per cent, largely due to difficulties involved in delivering lethal levels of gas. (57) The tragedy of nerve gas is largely found in its survivors. Iraq used tabun, usually accompanied by other nerve gases and/or mustard gas, in many battles of the Iraq-Iran War (targeting and intelligence services provided by the USA), and possibly against its Kurdish civilians. Could one of these chemicals have been involved in these Israeli gas attacks? Certainly not the super-potent VX type. Unlike the other nerve gases, VX is environmentally persistent, continuing to contaminate the attack area for weeks afterward. This does not seem to have been a factor in the attacks in occupied Palestine. Although the less potent soman and sarin gases break down quickly in the environment, they may be too powerful to deliver in reliably sub-lethal doses, which may have been the intent in these attacks. On the other hand, perhaps researchers at IIBR have been able to aerosolize minute amounts of sarin for broad dispersion of sub-lethal levels using a controlled-release design. Of the known nerve gases, the most likely candidate may be tabun. Tabun degrades quickly in the environment and its reported symptoms are similar to those reported in these attacks. (59) It is also quite possible that a novel agent or a combination of agents was used. In any event, we would be justified in expecting to find one of the organophosphate compounds commonly called "nerve gas." The Nerve Gases The nerve gases that have been developed for warfare are known as "anticholinesterase agents." They belong to the organophosphate family of chemicals, which includes a number of common pesticides. Traditional pesticides are essentially insect nerve gases, and kill by disrupting enzymatic pathways in the insect nervous system. In humans, nerve gases work by inhibiting the acetylcholinesterase enzyme (AChE), which enables the binding and breakdown of acetylcholine. Acetylcholine is vital for brain function, and is used by nerve cells to stimulate the muscles. of February and March, 2001? It bears repeating that this gas was released into the homes, schoolyards, and streets of occupied Palestine, where the presence of civilian men, women, and children was known to those deploying it. VIII. 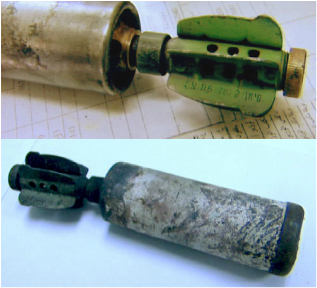 Were the gas canisters designed to attract? The hand-sized gas canisters lobbed (and fired?) by Israeli troops were unusual in several respects. In addition to their mysterious active ingredient(s), the canisters also appear to have featured staged release of colored smoke and a strangely attractive fragrance. This suggests something about the thoughts directing the design and construction of these unique weapons. Witnesses commonly reported that the gas canisters would 'explode' on impact, to release a billowing cloud of what initially was white smoke - similar to teargas, except that it seemed to have no odor at all. After a short period, perhaps two or three minutes, the smoke began to change colors, turning yellow, orange, "a rainbow", according to one man. And a mint fragrance emerged, with a sweet "taste", so good that several of the interviewed witnesses commented on its "pleasant smell." One man recalled, "..the smell was good. You want to breathe more. You feel good when you inhale it." Nerve gases are typically odorless, or nearly so. (61) It is possible that a nerve agent began dispersing as soon as the canisters blew open, when teenagers were shouting, "This gas in nothing! Throw more!" Mint fragrance is not mentioned in the literature for known nerve gases. Unless the IIBR, or someone else, has discovered a new type of sweet-tasting mint-flavored nerve gas, it seems likely that mint fragrance and possibly other flavors or attractants were added to the Israeli gas canisters. What was the purpose of this design? Why go to the trouble of producing smoke in a succession of colors? Why add (as we assume) an exceptionally attractive fragrance and taste to the poison gas? Was it all intended to give the canisters a less threatening aspect? Could there have been an effort to produce a "crowd-pleasing effect"--and so increase the toxic exposure, taking advantage of the delayed onset of symptoms? Why would anyone decide to attack civilians with a nerve poison? What would be the purpose of using a universally banned weapon against innocents in their homes? These questions are unfathomable, yet the events they ask us to explain stare us in the face. Someone crossed the line from the despicable practice of making such weapons to the criminally inhuman decision to use them. Who was ultimately responsible? The first attacks, in Khan Younis, occurred while the newly-elected Sharon government was still being formed. But the attacks continued in Gaza and the West Bank until the end of March, 2001, well after Ariel Sharon had officially assumed the helm. How many years had some souls inside the IIBR been yearning to test their life's work in the real world? Perhaps selected neighborhoods in Palestine could become laboratories for live experiments in advanced chemical weaponry. Areas like Khan Younis might be ideal. At the time of the attacks, Khan Younis was under strict Israeli blockade and had been teargassed so heavily and so often that its gas stories no longer elicited interest. There must have been some concern to avoid detection. Taken as a whole, the reports of the attacks present an apparent pattern. Very heavy and sustained barrages of conventional weaponry (two or more hours) typically preceded the launch of the gas attacks. This could have been an attempt to scare off witnesses, including newspeople, as well as an effort to create the deniability of chaos. Although these preceding barrages drove people into their homes, closed windows and doors offered very little protection from the gas. Although this article and its supporting documentation are only an initial survey of the open-source information about this incident, two very troubling facts seem to be established: Hundreds of Palestinian civilians were poisoned by an unknown agent released from canisters launched by the Israeli Defense Forces, and the devastating effects of these attacks were very similar to the effects produced by common nerve gases. The international community has a moral and statutory obligation to fully investigate these attacks to determine, to the best of current ability, what poison or poisons were used, to investigate the condition of the survivors and assist in providing the care they need, and to bring to justice under international law those who ordered the unconscionable use of universally banned weapons against innocent Palestinian civilians. This serious offense appears to be compounded by the use of toxic gases as weapons, a blatant violation of several international conventions intended to protect civilians and soldiers from the scourge of chemical warfare, including the Geneva Protocol of 1925 for the Prohibition of the Use of Asphyxiating, Poisonous or Other Gases, and of Bacteriological Methods of Warfare, the 1972 Convention on the Prohibition of the Development, Production and Stockpiling of Bacteriological (Biological) and Toxin Weapons and on their Destruction (BWC), and the 1993 Convention on the Prohibition of the Development, Production, Stockpiling and Use of Chemical Weapons and on their Destruction (CWC). Therefore, there are strong and compelling reasons to investigate each of the February and March, 2001, Israeli poison gas attacks as a possible grave breach of international law. (64) Commentaries: Protocol Additional to the Geneva Conventions of 12 August 1949, and relating to the Protection of Victims of International Armed Conflicts (Protocol I), 8 June 1977.